But that otherwise draws to a conclusion our coverage of the action from Franklin's Gardens. Thanks for joining us, we'll see you again at 14:15 GMT tomorrow. A final reminder, then, that we'll be back with full live text and radio commentary of each of the five remaining Premiership matches this weekend. 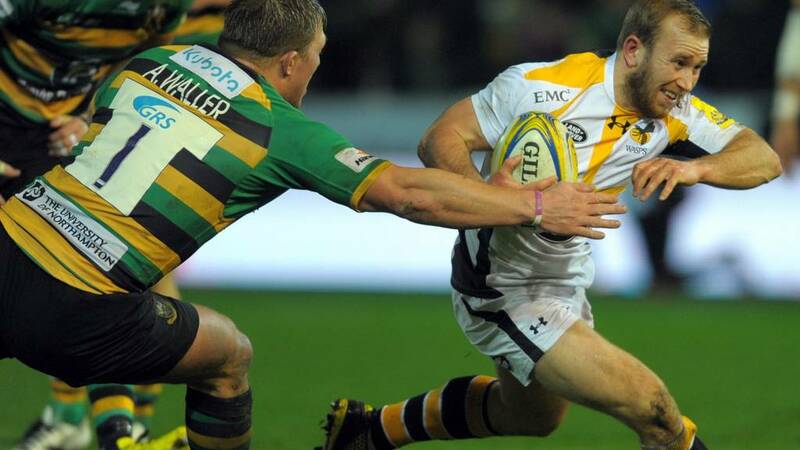 Wasps comfortably defeated Northampton Saints in difficult conditions to win at Franklin's Gardens for the first time since 2005. Scrum-half Dan Robson scored Wasps' first try when he found a gap and touched down on the post before Rob Miller crossed from close in. Josh Bassett's score helped make it 24-3 to the visitors at the break. Sam Dickinson scored in the corner for Saints in the second half, but Wasps leapfrog them in the Premiership table. You can read Phil Shepka's full report by clicking here. We've got to enjoy it. It's more than 10 years since we last won here, so hopefully it won't be another 10 years again. I thought the boys really made the right decisions tonight - I couldn't have asked any more of them. We've had a big couple of weeks in Europe and it's really stretched us as a squad, so to back it up in the league today is massive. Picking up wins against the teams above us in the league is what we want to do. Quote Message: Quite honestly you have to say that the scoreline flatters the Saints, because Wasps could have had a few more tonight. Quite honestly you have to say that the scoreline flatters the Saints, because Wasps could have had a few more tonight. And Harry Mallinder's poke through and out of play will bring about referee Tom Foley's final whistle. An eye-catching win for Wasps at the home of last season's Premiership table toppers. The answer, for now at least, is an emphatic "nope" as they can't even secure the line-out. Saints will try to run the ball from inside their own 22 again which, of course, could still leave a gap or two for Wasps to exploit should they knick it back. They've won a penalty too, have the men in white, which Jimmy Gopperth will send into the corner. Could Northampton be about to concede a try bonus point on their own ground for the first time in a year? Any hopes of a miraculous Northampton recovery are being snuffed out by Wasps, who have the ball back under their wings and allow their forwards to bash away down the middle, just over halfway. Less than four minutes left. In this wind, in this rain, and in the context of this game, that is not a try you'd have been expecting. With a broken field in front of them, the home side whizz up the left-hand side and deep into enemy territory. It actually looks as though Jimmy Gopperth may have stolen it, but Saints gather it once more and Sam Dickinson wriggles over. JJ Hanrahan, on for Stephen Myler, skews the kick wide but at least Saints have a try. This is excellent game management from Wasps, working through a dozen phases, not making a huge amount of ground but eating away at the clock. Could they even grab a fourth and bonus-point earning try? The first scrum is reset, and then from the second Wasps win a penalty, prompting yelps of excitement from their players, led by Nathan Hughes. Wasps continue to march towards victory. But it seems I spoke to soon. Teimana Harrison over-runs the ball, fails to gather the pass and ends up knocking on. Apologies if I'm beginning to sound like a broken record. Now Wasps concede a penalty and Northampton clear to touch. Not been the easiest watch, this second half. Quote Message: Why are the Saints so lacklustre? I can't see why the coaching staff aren't getting best out of these players. Why are the Saints so lacklustre? I can't see why the coaching staff aren't getting best out of these players. But this time Northampton are pinged at the line-out and so it's Wasps turn to head to touch. The visitors are back on the offensive and into the Saints half, but concede a penalty at the breakdown and Northampton will likely clear long and start again.